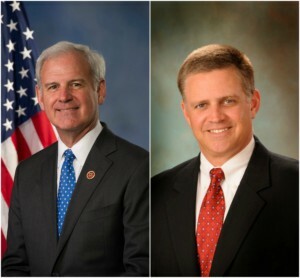 Congressmen Bradley Byrne (R-AL) and Drew Ferguson (R-GA) today announced a friendly wager on the College Football Playoff National Championship Game between the University of Alabama and the University of Georgia. Ferguson is staking Chick-fil-a on a Bulldog victory, and Byrne is risking Alabama seafood for a Crimson Tide win. Byrne is a graduate of the University of Alabama School of Law. Ferguson attended the University of Georgia before gaining early acceptance to the Medical College of Georgia.